The San Francisco Street Food Festival last Saturday was only a sample of the excitement in store for real food fans this weekend as the first annual Eat Real Festival gets underway this weekend in Oakland. Food, beer, music, and contests are planned for a 3-day celebration that encourages a healthy and sustainable alternative to our typical fast food lifestyles. The festivities begin this Friday, August 28, at 4:00 and will continue through the weekend with full days of food and fun events on Saturday and Sunday. Jack London Square in Oakland, CA is the center of all the action. Detailed directions can be found here. Chemicals and additives found in most of the foods we choose are contributing to mounting health problems, obesity, and an overall unhealthy society. Natural and organic options can change that, while also improving our environment as well as local economies. The Eat Real Festival shows just how easy it can be to make healthier choices by preparing 'fast food' with natural, sustainable ingredients whenever possible. Participating vendors have agreed to use at least one local ingredient and the festival supports more than 200 local and regional businesses. Not only are you making a healthier choice for yourself and the environment by Eating Real, you're also putting money back into the local economy! Saturday and Sunday, it's all about the food. Indulge your taste buds with nearly 50 local food carts and trucks, serving up everything from tacos and BBQ to coffee and sweets, or stop by the Good-to-Go market for fresh produce and homemade fares from dozens of Bay Area farmers. Watch local butchers compete in the butchery contest on Saturday or learn from some of the area's leading chefs in cooking demonstrations throughout the weekend, including kid-friendly demos each day. Live music performances are available on the music stage while the Curbside Cinema offers an outdoor movie experience Friday and Saturday night. Don't miss the Beer Shed - featuring the best microbrews available. The Beer Shed will be open throughout the festival and requires tickets that may be purchased in advance for $20 or at the event for $25. 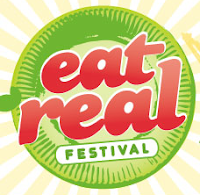 Check out a PDF version of the Eat Real Festival schedule here. Admission is free and includes free access to all the demonstrations, workshops, music, and movies. Street vendors will offer their fares at reasonable prices, ranging from $1 to $5. Beer shed tickets ($20 to $25) include 8 tastings, as well as a souvenir glass. Festival proceeds will benefit local charities, including La Cocina, People's Grocery, and Community Alliance with Family Farmers. The Eat Real Festival has also arranged several Keeping it Real Dinners, pairing premier Bay Area restaurants with local, nonprofit organizations to create mouthwatering menus that assist the growth of sustainable local foods. Visit the Eat Real Fest website for more information about the weekend's events, to buy tickets, or for details on volunteering.